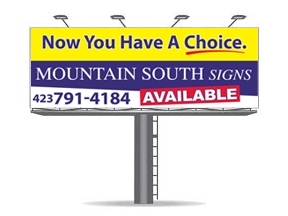 Mountain South Signs, a new billboard company offering quality billboard sites in Johnson City and the Tri-Cities Tn area. We are not the largest outdoor advertising supplier but a local company with value added services to offer our clients. We understand marketing needs and you will not be burdened by large corporate “Cookie Cutter” requirements.